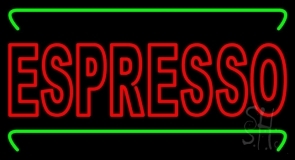 Serve those brewing cups of espresso with espresso neon signs. Entice those drivers and bikers with the aroma of your intense brewing specialty and draw them in with espresso neon signs. 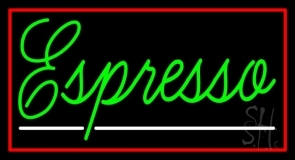 Espresso neon signs are the best form of advertisement for your coffee shop to highlight your specialty of serving best made espresso. Want some sparkle and dynamism for your establishment? 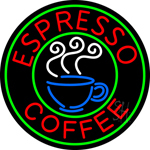 Hang those espresso animated neon signs across your shop fronts and watch your sales grow. Add some magnificence to your surrounds and give those coffee addicts a way to enjoy their conversations with espresso flashing neon signs. Glowing colors and stylish fonts of neon espresso signs will end into making your shop, a standout from others. We have a boundless collection of espresso neon lights designed with coffee mugs in a unique way. 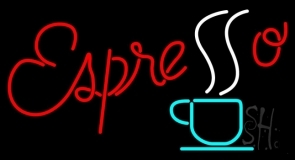 Espresso open neon signs in our stock espresso neon light signs will give a viewpoint of warmth and comfort to your customers beyond any doubt. 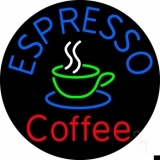 Our skilled graphic designers are proficient in hand crafting espresso neon signs that would be a perfect choice for your business to outshine from others. 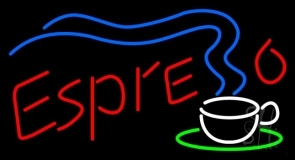 Describe your requirements to us and we will customize your espresso neon signs keeping your mind�s eye into picture. Decorate your coffee shops with different customized espresso neon signs like espresso flashing neon signs, espresso open neon signs and espresso animated neon signs. 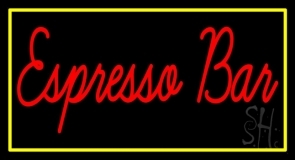 Visit us online or give us a call to get your espresso neon sign customized today!